George and Wesley Bryan, a pair of trick shot golfers known as The Bryan Bros, hit a golf ball from the rooftop of The Signature at MGM Grand into one of the holes at TopGolf Las Vegas. George and Wesley Bryan, a pair of trick shot golfers known as The Bryan Bros , hit a golf ball from the rooftop of The Signature at MGM Grand into one of the holes at TopGolf Las Vegas. The first brother bounced the golf ball from the head of his club, while the second brother hit the ball mid-air. The ball sailed 160 yards horizontally and dropped 500 feet vertically before landing in the hole. If the duo were playing a round of Topgolf, the brothers would have earned 5 points for hitting the brown target. 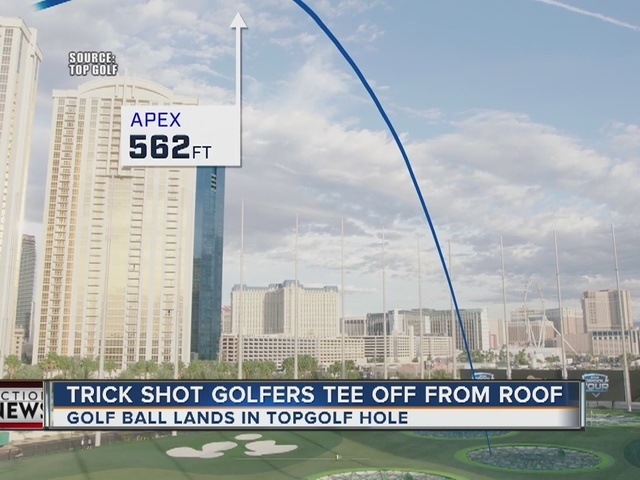 The trick shot was held to commemorate the inaugural Topgolf Tour Championship, which crowned its winning team on Sunday with a prize of $50,000.